Worst part: The dodgy CGI. Certainly, the sunny labyrinth of Los Angeles – sheltered by the Hollywood sign and supported by the Walk of Fame – wields many sights worth exploring. Indeed, anyone living outside the City of Angels has an idea of what’s on offer. As the hub of commercial entertainment, us Westerners rely on Hollywood to keep us engaged and relaxed. However, those who live in or have visited the landmark town know its many filthy secrets. Every inch of LA, from Compton to Santa Monica to Hollywood and Sunset Boulevards, is covered in a layer of scum. This is reflected in Tinseltown’s latest bout of self-deprecation, Maps to the Stars. Julianne Moore & Mia Wasikowska. With Maps to the Stars, a big-name director, commendable screenwriter, and several A-listers got together to kickstart the project. Despite the cast and crew’s immense buying power, this satirical-drama holds up on its own. Combating all forms of criticism, it’s difficult not to applaud the movie’s raw pride. This crime-thriller, taking on everything and everyone around it, breaks off into several valuable strands. Its narrative follows the Weiss family’s peculiar lifestyle. As one of (fictional) Hollywood’s most prestigious and ballsy families, the Weiss’ represent the archetypal Beverly Hills dynasty. The husband/father figure, Dr. Stafford Weiss (John Cusack), is a gutsy self-help guru/psychotherapist making his fortune from TV appearances and manuals. Obsessed with book tours and reputations, Stafford turns away from chaos and despair. The wife/mother figure, Cristina (Olivia Williams), is her thirteen-year-old son’s manic-depressive manager. Suffocating her child with pills and diet plans, her fragile frame of mind threatens to hurriedly destroy everything in her radius. The aforementioned son, Benjie (Evan Bird), is a mega-successful sitcom star bouncing back from a recent stint in a drug rehabilitation program. At the worst time possible, the daughter, Agatha (Mia Wasikowska), leaves a Floridian sanatorium to reconnect with her family. John Cusack & Evan Bird. Why was Agatha situated so far away from her family? What happened to the family before we met them, exactly? Why is she covered in horrific scars? I can’t tell anyone, as it would ruin Maps to the Stars‘ immense enjoyment factor. Inhaling The Shining, Sunset Boulevard, American Beauty, and Mulholland Drive, the movie fuses self-reflexive humour with confronting drama-thriller tropes. From the first frame onwards, writer Bruce Wagner – apparently on a hell-bent mission to skewer Tinseltown left, right, and centre – outlines his viewpoints and ideologies for the audience. In doing so, Wagner – basing his screenplay on his experiences whilst comparing it to Paul Eluard’s poem ‘Liberte’ – allows us to shape our own analyses. Adding obvious titbits to each line, Wagner illuminates the puzzle pieces throughout. The narrative, pieced together in varying ways depending on one’s knowledge of the industry, comments on modern showbiz’s pros and cons. Examining Hollywood’s cynical business decisions and shallow inhabitants, the narrative evenly spreads itself over several intriguing plot-strands and character arcs. 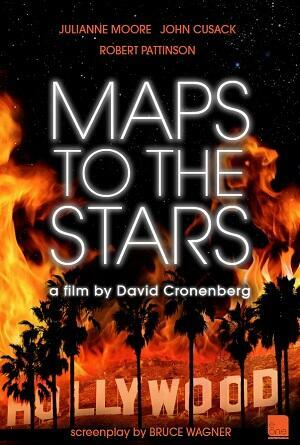 Despite the compelling material, Maps to the Stars never establishes a lead character. Early on, Agatha worms her way into Beverly Hills through a friendship with limo driver/actor/writer Jerome Fontana (Robert Pattinson). Thanks to her Twitter-based attachment to Carrie Fisher, this bizarre character becomes ageing actress/sexual abuse victim Havana Segrand(Julianne Moore)’s “chore whore” (personal assistant). Havana longs for a remake of a feature originally starring her deceased mother (Sarah Gadon). This satirical-drama, giving its characters many physical, spiritual, and psychological afflictions, waits for its subjects to unravel like a faux-Gucci outfit. “On the stairs of death I write your name, Liberty.” (Agatha Weiss (Mia Wasikowska), Maps to the Stars). Flipping between plot-strands, this psychological-thriller relies on its severe, agenda-setting methodology. Despite Wagner’s piercing dialogue and searing commentary, credit belongs to renowned Canadian director David Cronenberg (Videodrome, The Fly) for keeping everything under the surface. With each passing second, the master filmmaker supports Wagner’s argument by examining at his overwhelming viewpoints. Eclipsing his anti-establishment bottle flick Cosmopolis, Cronenberg hits a nerve most avoid like the plague. Like his 2012 limo-set drama, his cold, distant direction matches the agenda at every turn. Despite the tonal inconsistency, the filmmaker leaps between sub-plots with ease and determination. Sending shivers down the spine, his style amplifies the disgusting things our characters say and do. Learning from experience, his direction throws us normal folk into the chaos. His studio meetings, filmed entirely in medium close-ups, comes off like interrogations. Grappling with temptation, obsession, and greed, Cronenberg’s visual flourishes amplify the intensity. Amplified by Howard Shore’s piercing drum-lines and Peter Suschitzky’s mesmerising cinematography, the movie’s many climaxes and revelations hit like rejections. Unlike his more recent efforts (A History of Violence, A Dangerous Method), Cronenberg’s touch, like plastic surgery, rests on and under the surface. Tearing down egos and backstabbers, our talented performers capture a soap opera-like aura impeccably. Moore examines her searing role with gusto and vigour. Meddling with a despicable character (celebrating after a fellow actress drops out of a role due to tragic circumstances), she strips everything down to the bare essentials. Within Hollywood’s bright lights, gorgeous landmarks, and raging parties, a disease – turning fame and fortune into despicable traits – seeks to destroy everything. Causing LA’s dirt-covered veneer, this scourge of reality TV and tabloid media has severely degraded the glamour. Despite the overbearing agenda, Maps to the Stars has the cojones to bludgen Hollywood with its own golden statuettes. Thanks to scintillating performances, pithy dialogue, and kinetic visuals, this satirical-drama is Cronenberg’s best effort since Eastern Promises. Verdict: A compelling and confronting satirical-drama.